But clarinetist Marcus Eley was determined that the carefully-chosen program of works of the African Diaspora for clarinet and piano would have a life beyond the National Arts Festival. He searched for a suitable venue in which the duo could record. The two musicians recorded their program on July 13, 2009 at Endler Concert Hall, University of Stellenbosch, Stellenbosch, South Africa. Their acclaimed 2009 concert program is now easily accessible to people around the world through the Sono Luminus CD But Not Forgotten. We have already enjoyed a number of hearings, and look forward to many more. 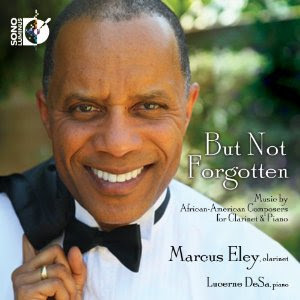 Marcus Eley's determination to record the works of several African Americans and one Nigerian before leaving South Africa reminds us of the philosophy of the African American conductor James DePreist. Music Critic James Reel wrote a cover article on the career of Maestro DePreist for Fanfare Magazine, Nov.-Dec., 1995. He quoted James DePreist on the subject of recording: "Recording for me is absolutely essential. What we do as musicians normally evaporates as soon as it's created. That's the nature of concerts." In a more recent example of the imperative to record live performances, trumpeter Martin McCain and pianist Artina McCain, who are husband and wife, performed works of Rachmaninoff, Lebedev and Tchrepnin live on KMFA-FM, in Austin, Texas on July 25, 2012. Dr. McCain has announced at his website that the duo will release a CD, Russian Treasures: Live at KMFA, on September 4, 2012 on the new Kairoi Music label. may emerge to increase the share of works composed or performed by musicians of color which are recorded. A July 13, 2012 post was titled: “Greg Kostraba: Quincy Hilliard's'Coty' on WBAA-FM.” Greg Kostraba, D.M.A. is Program Director at WBAA, Purdue University. He announced that Coty by Quincy Hilliard would be broadcast later that day. Three composers on the disc are featured at AfriClassical.com: Samuel Akpabot, William Grant Still and Scott Joplin. Alvin Batiste (1932-2007) is represented on the CD by Episodes (2:28), which Marcus Eley writes is taken from a larger work of chamber music. Clarence Cameron White (1880-1960) composed Basque Folk Song (2:34), a brief but attractive piece. Samuel Akpabot (1932-2000) of Nigeria is the only African represented on the recording. He composed Pastorale from Scenes from Nigeria (3:32), an orchestral work according to Marcus Eley. Quincy Hilliard (b. 1954) tells AfriClassical he had his favorite uncle in mind when he composed Coty. Its movements are Daybreak (1:36), Sunset (3:12) and Dance (1:57). Scott Joplin (c. 1867-1917) composed Weeping Willow: A Ragtime Two-Step (2:51). Todd Cochran (b. 1951) is represented by Soul-Bird (8:26). The recording closes with Amazing Grace (Arranged by H. Stevenson) (3:47).